We recently published a protocol for pathway enrichment analysis of genomics data. The last protocol for this was published in 2009. Much has changed in the field since then, so a new protocol was much needed. We have been developing and refining pathway analysis methods for over ten years, while performing pathway analysis for dozens of papers. Our goal for writing the protocol was to summarize and communicate our experience and recommendations for the frequently encountered task of pathway enrichment analysis of a gene list. In particular, we want everyone to know that you don’t need to be a bioinformatics expert to perform high quality pathway analysis - anyone a can do it using easy to use websites, like g:Profiler, and point-and-click desktop software, like GSEA and Cytoscape. 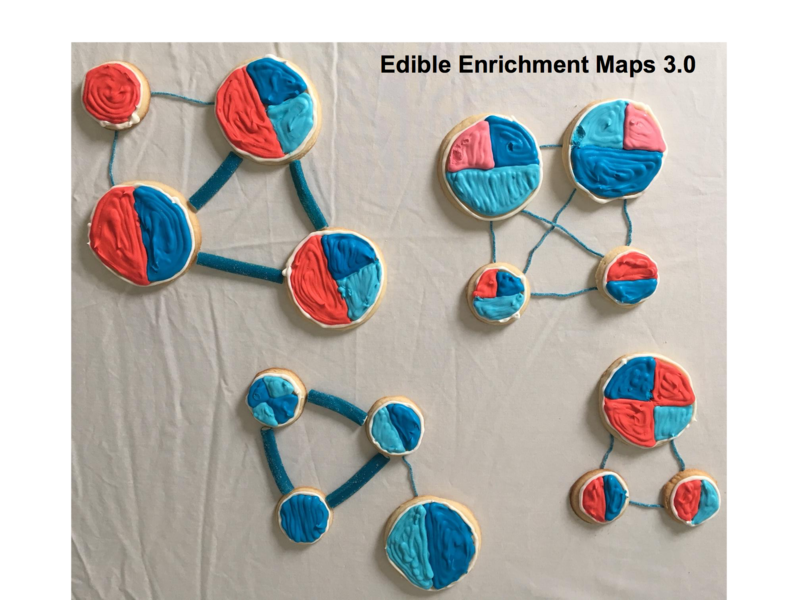 A key part of our workflow is visualizing the results as an Enrichment Map. This provides a visual overview of all the pathways changing in the experiment. Interesting pathways can then be quickly identified for focused study. Originally developed in the programming language R, the first implementation of our pathway enrichment analysis workflow using Enrichment Map, was very time consuming and required manually loading results into Cytoscape with final formatting in Powerpoint. 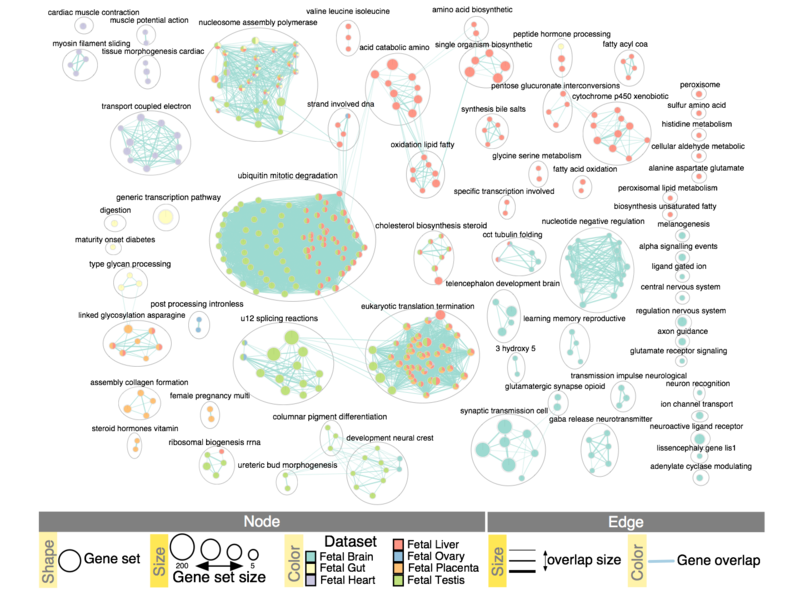 To streamline use, we developed the workflow as an app for the user-friendly Cytoscape network visualization software (www.cytoscape.org) and added automation and publication quality figure generation features over time. This was aided by new Cytoscape technology that enabled apps to communicate with each other, so we could integrate the clusterMaker2, WordCloud and AutoAnnotate apps to substantially improve the workflow. All of these were developed with the biologist in mind, providing key pathway analysis capabilities without the need to know a computer programming language. However, if needed, the workflow can be controlled programmatically through the Cytoscape Restful Interface (Ono, K, et al. F1000Research 4 (2015)). For instance, biologists proficient in R can easily incorporate the enrichment map workflow into their analysis using our example R Notebooks. As we move to the future, wouldn’t it be great if you could run and visualize your analysis workflow from any connected device? The team behind the Pathway Commons meta-database (www.pathwaycommons.org) have developed a Google-like search engine (apps.pathwaycommons.org/search) for pathway information that integrates with a pathway enrichment analysis app: Simply paste in a gene list into the search box, and the app returns an Enrichment Map, based on g:Profiler results (e.g. apps.pathwaycommons.org/enrichment?source=PCNA%2CXRCC2%2CXRCC3%2CRAD50%2CRAD51). This system will improve over time, making it more powerful, but also keeping it simple, just like Google search. Written by Ruth Isserlin, Jeff Wong, and Gary D. Bader on behalf of all the authors of the protocol.